Jean Grant-Sutton is passionate about yoga! As a teenager, she understood the benefits of this ancient art and science, to help manage the stress of balancing school and work. The deep rewards she experienced inspired a year long journey to India. Jean studied at the Sri Aurobindo Ashram in Pondicherry, as well as visiting other places in India, Nepal, Thailand and Bali, exploring the Eastern Philosophies of Yoga and Buddhism. Before Jean dedicated her career to Yoga, she had a Certified Massage Therapist practice for 15 years. She is knowledgeable in many modalities such as: Shiatsu, Breema, Swedish and Trager. As the Founder and Director of BodyWorks Integrative Yoga and Stress Management Center in Petaluma, California, Jean Grant-Sutton received intense fulfillment from operating a studio dedicated to Yoga. Creating a sanctuary for people to come practice Yoga. in its wholeness of the 8-fold path, as illuminated in the ancient Yoga Sutra text of Patanjali. In 2013 the studio was severely damaged by smoke from a nearby fire and was forced to close. A very sad time for the Petaluma yoga community. In 2005, Jean created the premier 200 hour Affiliate Integrative Yoga Teacher Program for Northern California. She is very proud to have graduated 7 years of well-trained teachers of the Integrative style. Jean Sutton’s intention is to transmit the great joy, understanding and well-being that yoga provides for our body, mind and spirit. Currently, Jean is the Yoga Program Director at P.O.S.T. Wellness by Design in Petaluma, California. She is registered with Yoga Alliance, certified as an Integrative Yoga 500-hour Advanced Professional Yoga Therapist, and has been teaching yoga since 1994. Her classes encompass her extensive bodywork experience, which brings forward a deep understanding and love of form, alignment, and anatomy. She acclaims her foundation teachers, Kate Pelly (Iyengar), Ian Rawlinson (Desikachar) and Joseph LePage (Integrative). Also, being deeply influenced over the years by Erich Schiffman, Scott Blossom, Richard Miller, Anodea Judith, and Judith Lasater. 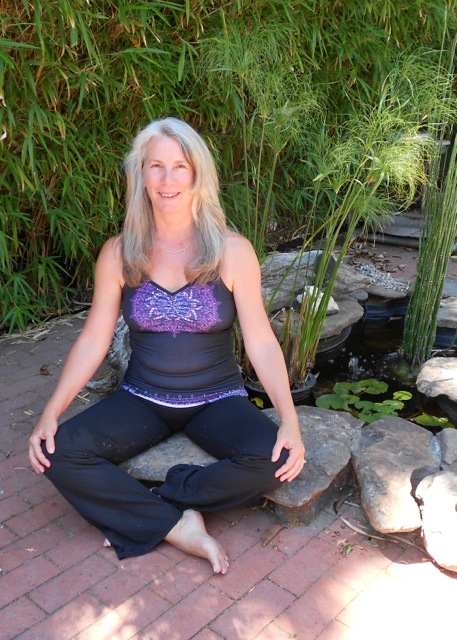 Jean offers yoga classes, workshops, retreats, and trainings as well as private yoga therapy. I started working with Jean after experiencing severe anxiety and panic attacks. Jean was instrumental in teaching me to breathe in a way that helps me maintain better control over my body and mind. Jean quickly understood the physical and spiritual guidance I needed to begin the healing process. We’ve been working together seven months now, and with Jean’s continued guidance and daily practice I’ve learned to better manage my anxiety, have become stronger and more flexible, and most importantly I’m living a more balanced life.